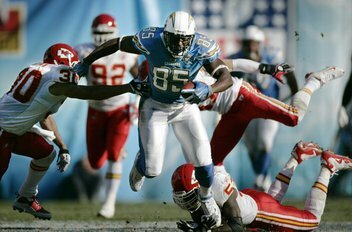 Antonio Gates laid waste to the KC Chiefs yesterday en route to the 2nd best record in the AFC. The Chargers are tied with Cincinnati who they face off against on December 20th. The Chargers could be in a 3 way tie after tonight’s game between the Saints and the Pats if New England wins. The Chargers face the Brows next weekend and then have an arguably tough schedule. Dallas, Cincinnati, and Tennessee are all playing good football right now and the Chargers will have to bear down in order to get these wins and stay in the hunt for home-field advantage in the playoffs. Additionally, the Broncos are right behind us and have a pretty easy schedule minus the Colts game. Through week 12, the Chargers are looking good… here’s to them staying that way! Previous PostChargers Blackout? 11/29 UPDATENext PostUSC Football and Fans Have a Bright Future!